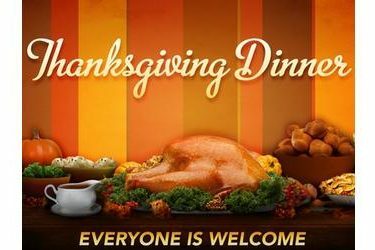 The college will be serving a free Thanksgiving dinner with all the trimmings for the whole community TODAY starting at 11:30 am at the Student Union, running through 1 pm. We are thankful for our community, our students, their families, especially after last night’s scary weather, the world political situation — we have so much to be thankful for right here at home. We’d love for folks to come out, sit down to eat, and share our sense of gratitude for what is good in this world.